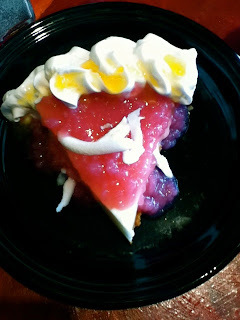 Try out this new fabulous restaurant in Pahoa, next to Shaka's in the old Pahoa Village Cafe location - just 5 minutes from Hale Moana Bed & Breakfast in the heart of Pahoa Town. 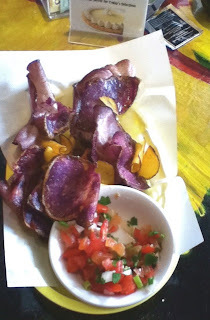 Pele's Kitchen is a great addition to the Pahoa Restaurant mix. It just recently moved from the Hilo Town Tavern in Downtown Hilo to Pahoa and is now open to serve breakfast, lunch and dinner. Hours are 7 am - 1pm daily with dinner served on Friday & Saturday. Sushi hours are Thursday - Saturday. The number to call for reservations or to order take out is 935-0550. Pele's Kitchen owners, Stephen & Liz Yundt, known locally as Uncle & Auntie, serve up their country breakfast with a wild jungle flavor. 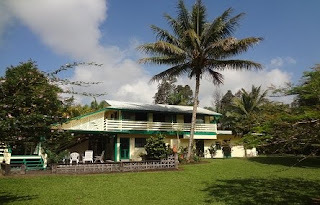 Homemade breads, desserts and cinnamon rolls, banana bread and homemade tropical syrups like lilikoi, coconut & guava greet their diners every morning. Breakfast flair includes such exotic items as "Mango Blintzes", "Cinnamon-Apple French Toast" and classics like Eggs Benedict and Huevos Rancheros. Lunches include Puna Burgers, Reuben' Sandwich, Huli-Huli chicken sandwich, exotic salds like Princess of the Jungle and even homade raviolis in local style flavors like Chicken-Macadamia, Kalua Pork and Hawaiian Grass-Fed Beef. 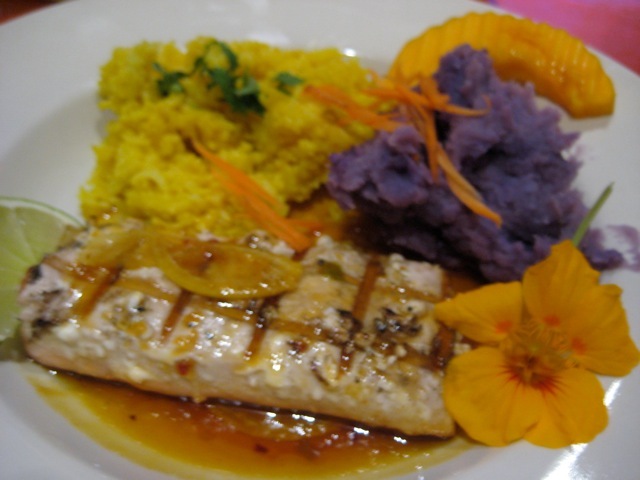 Specials include a delectable fish sandwich featuring local ono caught right out of Pohoiki. Uncle's fabulous dessert choices include such originals as the Puna Pie, Mountain Apple Pie, Chocolate Eclairs, Mango Pie, Blackberrry Pie, Pohaberry Pie and Macadamia Tarts. Auntie Liz greets everyone at the door and is a source for information on the local area. Auntie is an artist, making customized t-shirts and showing customers how to make ti-leaf leis. 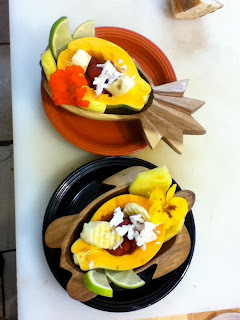 She also creates delicious jungle juices like lilikoi-calamansi and local ginger iced tea. 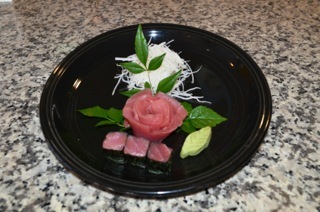 Japanese Sushi Master, Kiji Ichikawa joins hte staff Thursday - Saturday to present sushi creations that are renown all over Hawaii. What impressed my kids and me about Pele's Kitchen was the quality of the food, the attention to detail and the personal atmosphere with excellent service. We went to the restaurant based on the recommendation of friends and had a variety of dishes: Taro & Yam Chips and Maui Onion Rings for starters, the Sushi Special of the day, the bacon burger with fries and the fish special with tumeric rice, mashed purple sweet potatoes and salad for our main course. For desert we tried the mountain apple and black berry pies. To drink we had the lilikoi-calamansi and a beer from the bar next door. All was absolutely delicious. All ingredients are from local growers and the owners' garden. If you are there for dinner on the weekends you may also catch the band playing at Shaka's - it's right next to the restaurant. 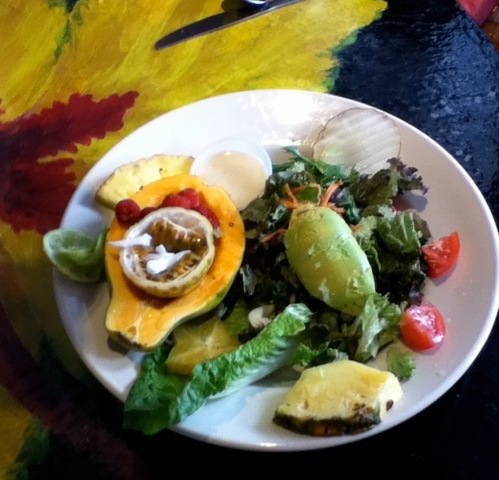 Pele's Kitchen offers a great variety of choices for vegetarians and vegans. Last and certainly not least! 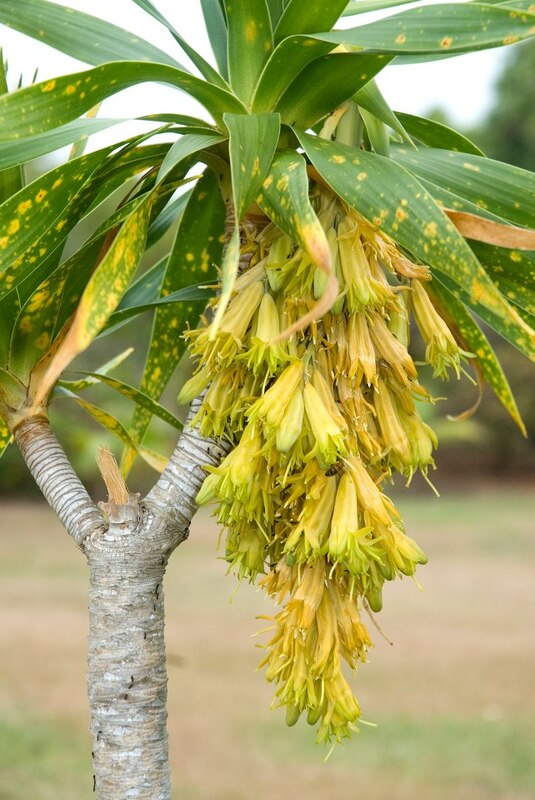 Today’s hula plant of the day is hala pepe (Pleomele hawaiiensis), and it honors the seventh and final day of the Merrie Monarch Festival, celebrating its 50th anniversary this year. 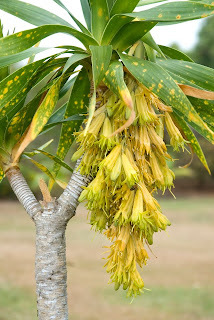 Hala pepe is one of the most highly esteemed plants used to adorn the kuahu, or hula altar, to honor Laka, the goddess of hula, and is considered the kino lau, or spiritual form, of Kapo, another hula goddess. 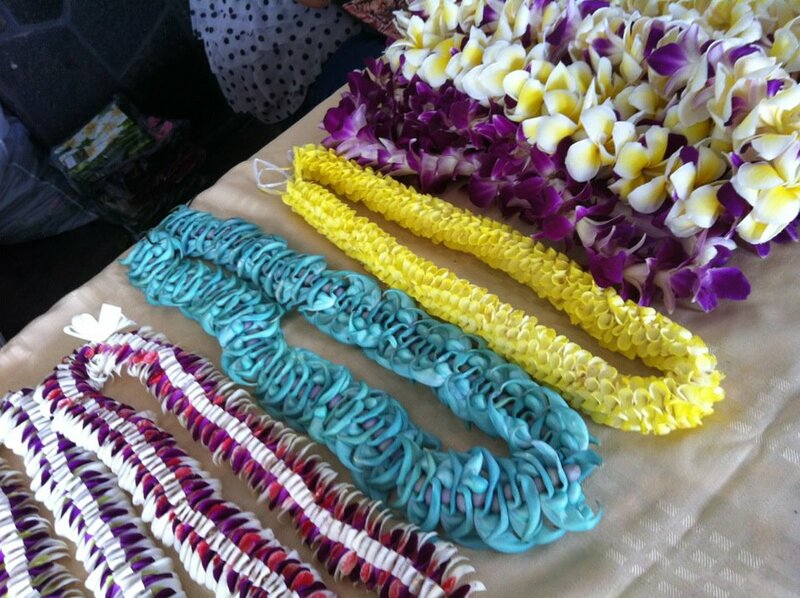 Its two-inch flowers can also be used for lei. This stunning plant belongs to the agave sub-family, and can grow 20 feet or higher. There are several types of hala pepe endemic to specific islands. Pleomele hawaiiensis is endemic to Hawai‘i Island, and can be found in dryland forests and other mesic regions. It is the rarest species of hala pepe, and is federally listed as endangered. Outside the park, its survival is threatened by goats, cattle, alien grasses, fire, and development. Park resource managers are working to increase the numbers of hala pepe in the park, though propagation, out-planting, and protection. 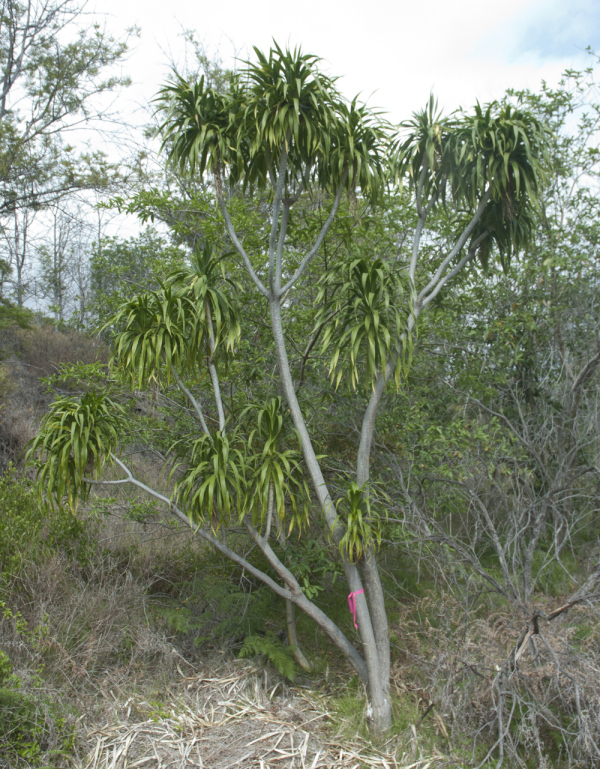 Currently, less than 20 mature, wild hala pepe are found scattered throughout drier areas of Hawai‘i Volcanoes National Park. 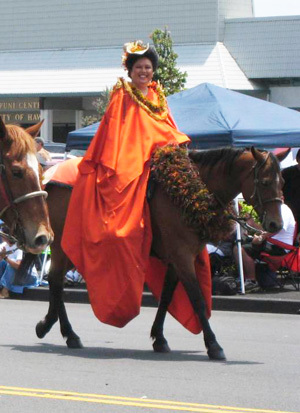 Merrie Monarch Royal Parade : starting at 10:30AM in downtown Hilo. Here are some pictures from previous Parades in 2009 and 2008 to get an idea of what it is like. Group Hula 'Auana Competition: 6PM Edith Kanaka'ole Multipurpose Stadium - tickets needed. Televised and live stream over the internet by KFVE. 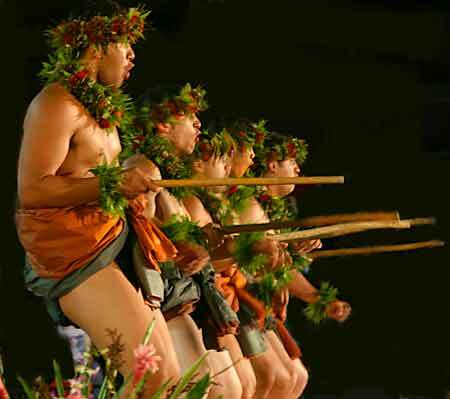 If you are new to Hula, you need some Hawaiian language to help understand and appreciate hula and the cultural aspects of the dance. Here is a list of words used commonly during the Merrie Monarch festival. Aloha - is used to say hello and goodbye and desribes a kind of love or respect for something or someone. It is sometimes used in the negative: "He has no aloha!" 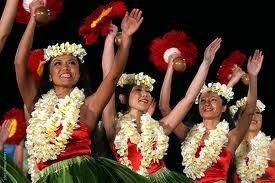 Halau - With regard to hula, this means a Hula group or school usually under the direction of Kumu. It means long house for canoes as well. Heiau - Hawaiian platform Temple. Heiau can be visited in National and State parks around Hawaii island Hula Kahiko - Hula composed prior to 1893 and does not include modern musical instruments. 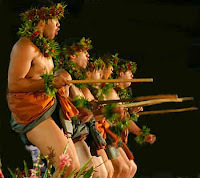 Types of Hula Kahiko include ‘āla’apapa, ha’a, ‘olapa, and others. Hula is performed with chants accompanied by sticks and gourd drums and performed in malo, or loincloth, and pā’ū, or wrapped skirt, and clothing made of grass and flowers. Merrie Monarch - The Merrie Monarch refers to King David Kalākaua who reigned over the Kingdom of Hawaii from 1874 until his death in 1891. He was a patron of the arts and is given credit for revitalizing Hula in Hawaii. Pau - Finished, no more: "Food all Pau"
‘Ōlapa (Cheirodendron trigynum) is the hula plant of the day, honoring the sixth day of the 50th annual Merrie Monarch Festival. ‘Ōlapa, which means dancer in Hawaiian, was named for the way its graceful leaves flutter in the slightest breeze. 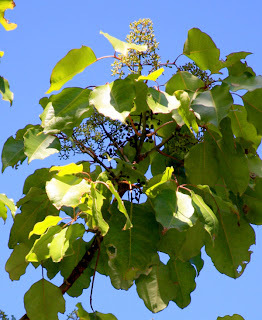 ‘Ōlapa are abundant in the park’s rain forests, and are noticeable along Highway 11 when approaching the park entrance from Puna. 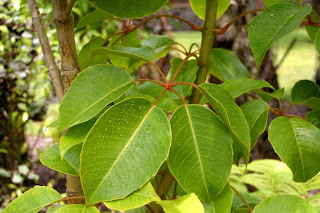 They are also observed growing along the path leading to Thurston Lava Tube, and in other rain forest sections of the park. Visit the Hawai‘i Pacific Parks Association park stores for a marvelous selection of books and other merchandise celebrating all things Hawaiian.